I didn't plan on writing about this (hence the bad cellphone pics), but it turned out to be a really interesting experience and worth blogging about. Mid-December, wanting to be healthier for the New Year, my boyfriend suggested we go Keto, and my original response was, "I'd rather die." At that point I only understood the most basic concept of Keto, which is that it limits carbohydrate intake, forcing your body into burning fat stores instead. Wanting to strengthen my argument (and hoping to talk my boyfriend out of it) I started researching Ketogenic diets online. 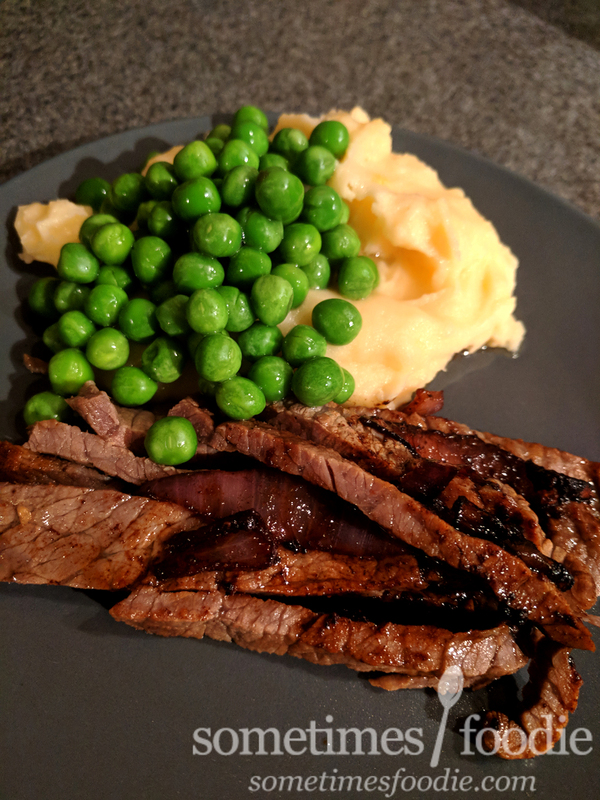 Several weeks of Pro-Keto YouTube videos, blog posts, recipes, and Reddit threads later, I had a much better understanding...and I still refused to do it. As I thought, the goal of a Ketogenic diets is to burn keytones for energy, and to do that, you need to cut your carb intake down to very VERY low levels, somewhere between 20-100 grams per day, while eating a diet rich with proteins and fats. This dietary-lifestyle has it's benefits, like balancing out sugars for diabetics, or treating some forms of epilepsy, but it's pretty extreme for a casual dieter such as myself. To put it into perspective, one average-sized apple contains 25 grams of carbs. If you're on the lower end of the carb-limiting spectrum, that already put you over your daily limit. Before we go any further (and the cult-of-Keto tear me to shreds), let me clearly state that I am NOT a diet expert, nutritionist or medical professional. I'm a 30 year old Jersey girl who buys junk food, takes pictures of it, and (sometimes) writes about it on the internet. He let me sleep in and made his very first keto-meal himself. He made bacon and eggs with a cup of coffee. It was almost like our normal, non-diet, breakfasts, but he had to take his coffee with Stevia instead of sugar, and a drop of heavy cream since he couldn't have normal milk, but all-in-all, it wasn't that different from our usual breakfasts. Then we went to Aldi to do some Keto grocery shopping. We grabbed the keto-basics: heavy cream, cream cheese, tons of meat (sausages, bacon, chicken thighs, strip steak...etc. ), cheese, pork rinds, almonds, a tub of mixed nuts, jerky, unsweetened almond milk, asparagus, avocados, spinach, and snack-style cheese sticks. As you can see, it's a lot of savory foods. To try and give him some options we got some super dark chocolate bars, I think it was Aldi's 80% dark bars, but that was pretty much the only sweet item we could find within his daily carb allowance. I like grocery shopping, so I actually had fun during this part, but my boyfriend was antagonized by all the food on the shelves that he couldn't have on his (self-imposed) diet. For lunch, I made him a chicken and ranch salad. It was just romaine, baby spinach, and radicchio with roasted herb-buttered chicken breast and Keto-ranch dressing...which we Frankenstein'd ourselves. I got powdered ranch seasoning and mixed it up with heavy cream. The result was a very thin dressing that tasted like Cool Ranch Doritos. This was a hit with my ranch-loving boyfriend and I was pretty proud of our keto-culinary-ingenuity. 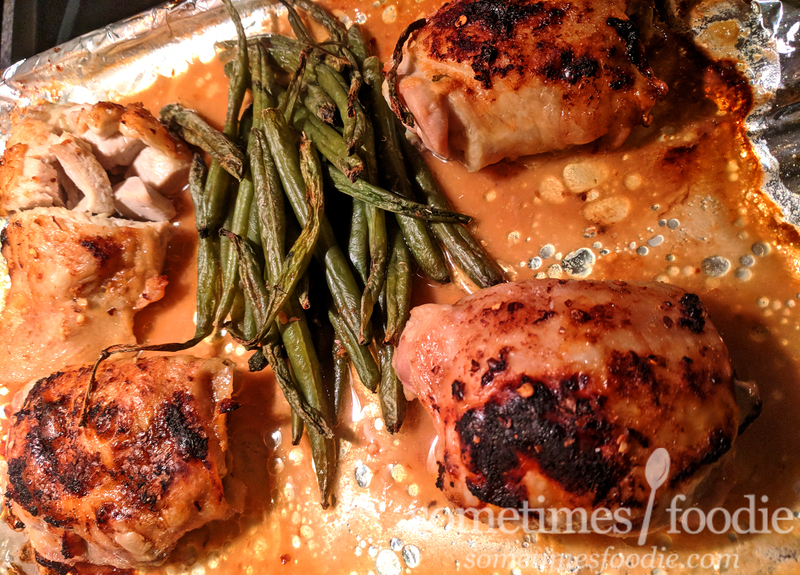 Several fistfuls of cheese sticks, almonds, and dark chocolate bars later, it was dinner time and he had more meat (Chicken breasts), this time with a side of asparagus, and flavored seltzer water. The first day went well, my boyfriend was excited to start this journey and overall he didn't think it was going to be as bad as me (and his daughter) made it out to be. Fairly uneventful. He woke up after dreaming about candy bars he already missed, like his favorite, a Hersey bar with almonds. I suggested eating some of the sea salt almonds with the dark chocolate bars we purchased. This kind of satisfied the craving, but it tasted like a sad, bitter, version of what he really wanted. Breakfast was an omelette with shredded cheddar cheese, butter and leftover asparagus with more bacon, and more heavy-cream-Stevia-coffee. Lunch was a delicious avocado boat with an over easy egg topped with crumbled bacon and shredded cheddar cheese. Another hit with the boyfriend, and something I used to make for my sister and I on lazy Sunday mornings. At this point, he started crashing in the evenings. After dinner, he fell asleep on the couch and it took me several attempts to get him up to go upstairs to actual bed. The first work day on Keto. 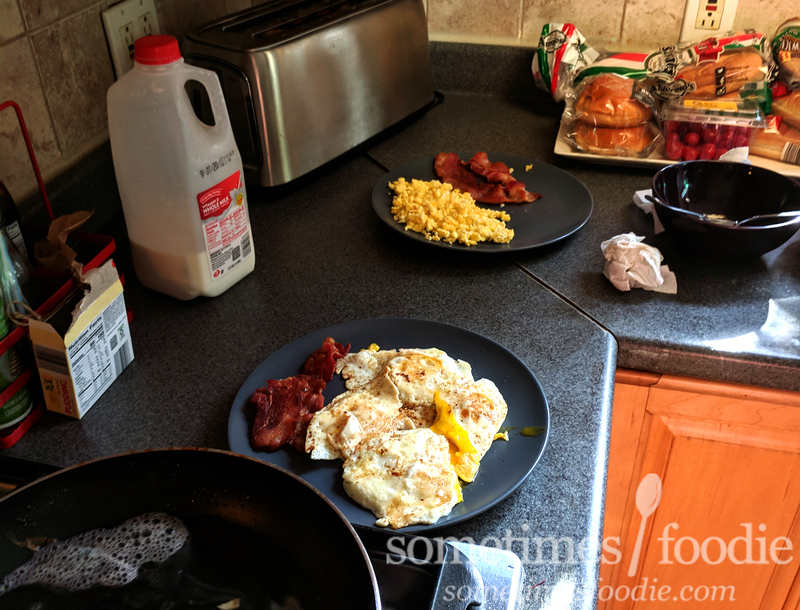 I made sausage and bacon the night before, so he could heat them up easily in the morning, and he cooked up some eggs with more Keto-coffee. He took four hard-boiled eggs to work, along with some jerky, mozzarella cheese sticks, and some sugar free Red-Bull. For dinner, I cooked up the strip steak with a some onions fried in butter (you can have some onion, but not a lot on Keto), and some green beans, with another keto-ranch-dressing salad on the side. I really wanted to get some fresh greens into his diet because everything was so meat and salt heavy. It made me nervous about his heart. This is when his mood started shifting, he started getting very grumpy and easily irritated, and he kept falling asleep on the couch after work. It was nearly impossible to wake him up, he had no energy at all and started buying diet sodas for more of a caffeine boost. More hard boiled eggs and bacon with coffee for breakfast (with a little leftover sausage). At this point, leftovers from Keto dinners were turned into lunches, and by the time he came home for dinner he was craving something sweet REALLY badly. He'd already blown through all his dark chocolate, so we went to Walgreens to grab Keto test strips (to see where he current level was at this point) and check out the sugar free candy...which was a total loss. All of the sugar free stuff still had way too many carbs. Eventually we found some sugar free Werther's Originals on the shelves that weren't great, but wouldn't break the keto-carb-bank, and headed home. To try and change things up I made Keto-friendly "sushi" bowls. Well, me and his daughter had sushi bowls, because we had rice. 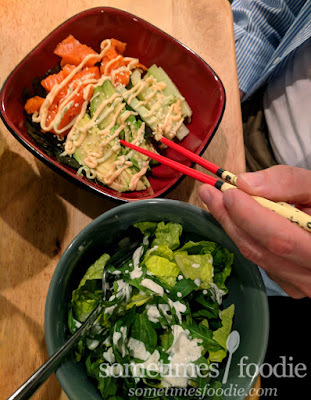 His bowl contained a tiny bit of seaweed, cucumber sticks, salmon, and a sliced avocado with some sesame seeds, and a drizzle of keto-friendly mayo mixed with a tiny dollop of sriracha and another sauce that was mayo mixed with tiny drop of wasabi paste. 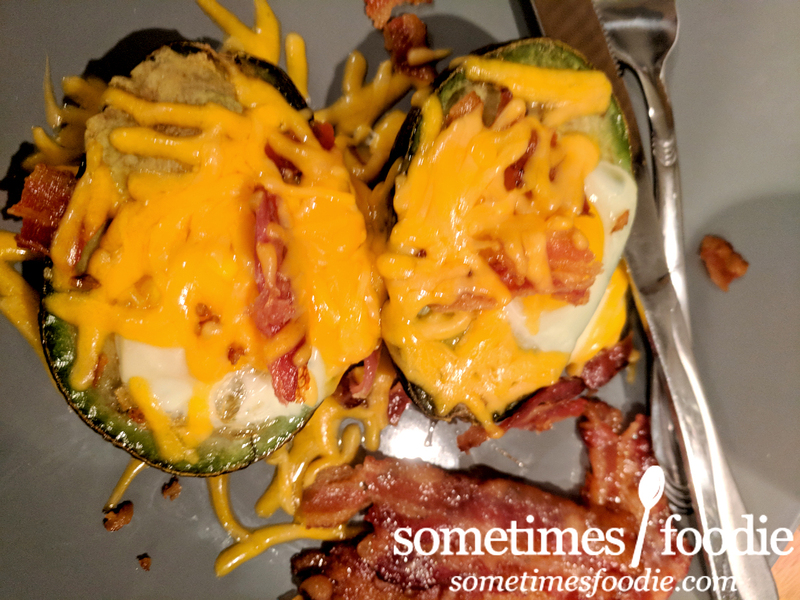 I served this alongside another keto-ranch salad, and it helped break the monotony of meat and veggies for dinner every night. He was tired, miserable, and missing sweets. Normally, my boyfriend is a happy and playful guy, he loves to tease and joke, but at this point everyone around him started pointing out his bad mood. This was the day I created a dish that was a crime against humanity. This day started out the same as the others: eggs and proteins for breakfast, keto-coffee, sugar-free Redbull, and leftover chicken and veggies with a diet soda for lunch. For dinner I made chicken thighs marinated with lime juice, garlic, a little bit of Stevia, and red chili flake. This was a big hit with both him and his daughter. I served it with green beans and brussel sprouts that had been cooked in bacon fat with garlic and a teeny tiny splash of balsamic vinegar. This time, we all ate the same meal, except me and his daughter had corn as well as the green veggies. Knowing how miserable he was, I spent the majority of my free time researching Keto desserts to cheer him up, and I gotta tell you, as someone who loves to cook...they made me so incredibly sad to read. It was all fake sugars, little-to-no fruit, really dark chocolate, almond or coconut flour, eggs, and coconut oil. The cake was made with butter, really dark unsweetened chocolate, unsweetened cocoa powder, eggs, vanilla extract, and artificial sweetener. (We used Stevia, my boyfriend's fake-sugar-preference.) I mixed it all up, as per the instructions, and carefully spooned the fluffy batter into a cake pan lined with parchment paper. As it cooked, it smelled pleasant and looked really fluffy, but the light and airy cake quickly deflated like a football in the hands of Tom Brady. (Oooo! Shots fired! I only know sport stuff like this because of my boyfriend.) The end result was a flat, hockey-puck-looking brownie base, which wasn't as appealing as all the blog images made it out to be, but it did look dense and fudgey, so I hadn't given up on it yet. I took the first bite and...it was hands down the worst thing I have ever baked. In my opinion, it tasted like a used up espresso ground puck covered in Stevia. This was the diet soda of brownies, and it was a sad, sad, culinary moment for me. 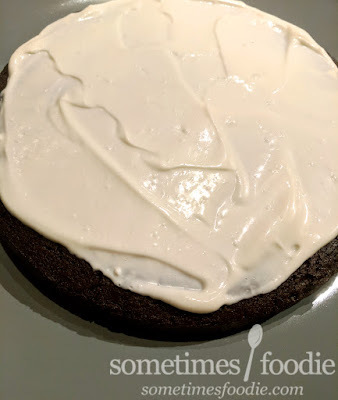 Still hoping to salvage this, I whipped up some Keto-friendly cream cheese icing, which is cream cheese, butter, vanilla and even more fake sugar...which I now realize was the foodie-equivalent of throwing gasoline on a dumpster fire. On it's own, the icing actually wasn't TOO bad, the cheesiness helped to mask some of the fake sugar flavoring, but two wrongs don't make a right. His daughter and I were only brave enough to eat one bite of this monstrosity, my Keto boyfriend, brave soul that he is, ate three slices before calling it quits with a glass of watered down heavy cream as a cold milk substitute. Watching him try to convince himself that it was somehow okay-tasting made me want to cry like those old (culturally insensitive) littering commercials. I do not like to throw food away, but this was not food. This was mouth-grade chemical warfare. As soon as my boyfriend called it quits, I tossed this thing right into the garbage. He ended up eating a spoonful of honey flavored goat cheese instead. Hard boiled eggs for breakfast, more coffee, and leftover chicken with Brussels sprouts for lunch...at this point he was officially in ketosis (according to the strips) and lost 1 pound of weight. He was miserable, grumpy, and exhausted. Lunch time came, he ate one, cold, Brussels sprout from his lunchbox and just snapped, he binged on a turkey wrap, a cupcake, real soda, and candy with real sugar and texted me that he was done with Keto. Being the supportive girlfriend I am, I picked up pizza and wings to celebrate. * Updated because we used Stevia, not Splenda. Sounds miserable. I went through a phase in my early 30s while slinging weights a lot more than I do now. Felt like all I ate was tuna from a can, baked chicken, and brown rice. I looked great, but I was totally miserable. Now I just eat whatever I eat while I still sling weights. I'm in better shape than 90 percent of other guys my age (48). Anyway, how do you prevent from getting constipated from a keto diet? I guess the avocado helps. But that's looks to be about it. After a day or two he got some fiber supplements from Walgreens to add into his diet, along with a multivitamin to help things out, and I think that's pretty typical for more people doing the Keto diet. Ah ok, that makes sense. I wasn't even thinking supplements. And LOL at me, I didn't mean to sound like a narcissist above. I should have said that I eat what I want in moderation. Plus I'm blessed with pretty decent genes, except for being short for a guy...ha ha. I should also add that I don't have a sweet tooth, which is a huge advantage. 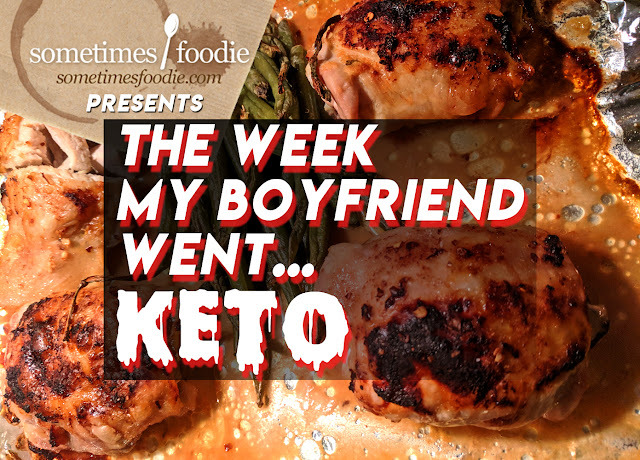 That was an interesting read, although from what I can tell he didn't really get into ketosis and was experiencing some severe keto flu symptoms. However, the keto diet can definitely be hard without any supplements.